As some of you may know, I don’t really have a proper sewing space yet, and am already developing master plans of amazing sewing spaces for when we move in to our new flat! In the meantime I have to satisfy myself with making little tweaks to the little table that sits in our lounge where my sewing machine lives. Tweak of the week was my discovery of these super cute Mason Jars. 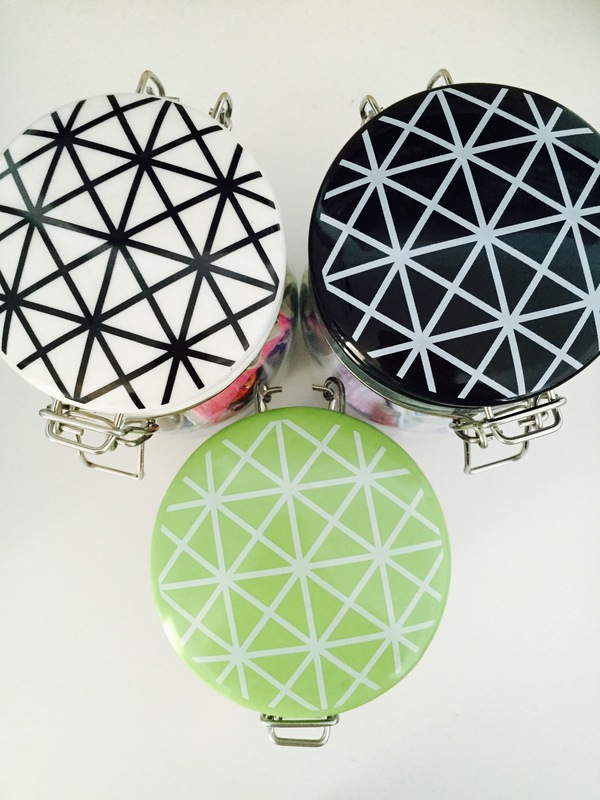 I normally use Mason Jars to put salads in for my lunch at work, but when I discovered these with ceramic geometric design lids, I thought they would be great for holding sewing notions. I like the way that they almost make a feature of all the bits and bobs that come with sewing! The jars of bits and bobbins currently sit on top of a slightly boring looking little Ikea organiser. It’s actually really helpful though for holding all sorts of sewing related little things. I’m planning on jazzing up this little box with Washi tape, as per this tutorial I found online. 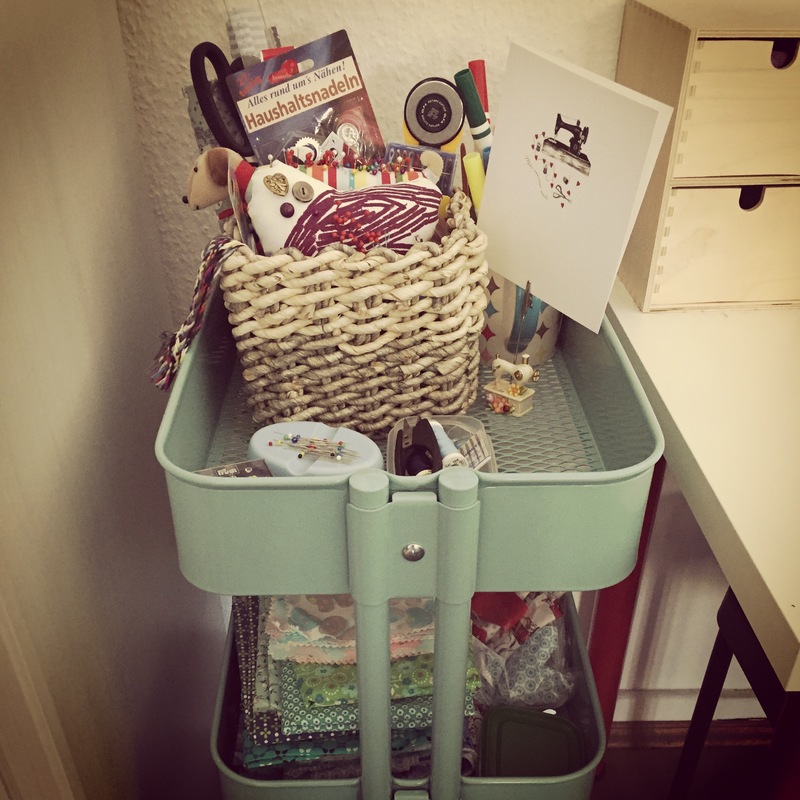 Any tutorial called “how to unboring-ize a desk organiser” has to be a winner! I might see if I can find some Washi tape today in some cool colours, so check back later to see if I have any success! 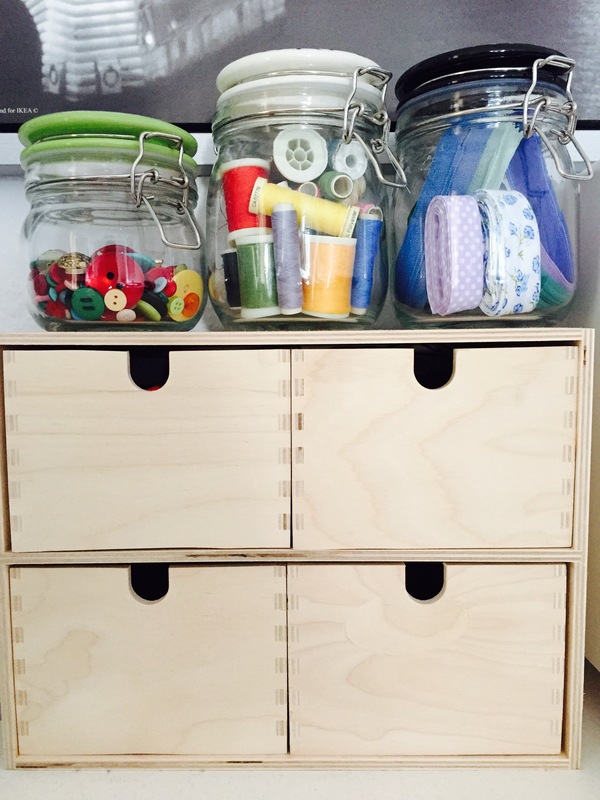 The last thing I wanted to share with you is my absolute favourite part of my mini sewing corner – my Ikea Raskog trolley. These trolleys are well blogged about by sewers across the internet, and they really aren’t wrong. What is particularly helpful for me is that I can wheel it out to my dining table, so it’s like having a portable sewing room! It can get a little messy sometimes (this is the tidy version! ), but it usually only takes 5 minutes to get it back in order. Dave the Dachshund now proudly rides around in the trolley and keeps my sewing cheery! 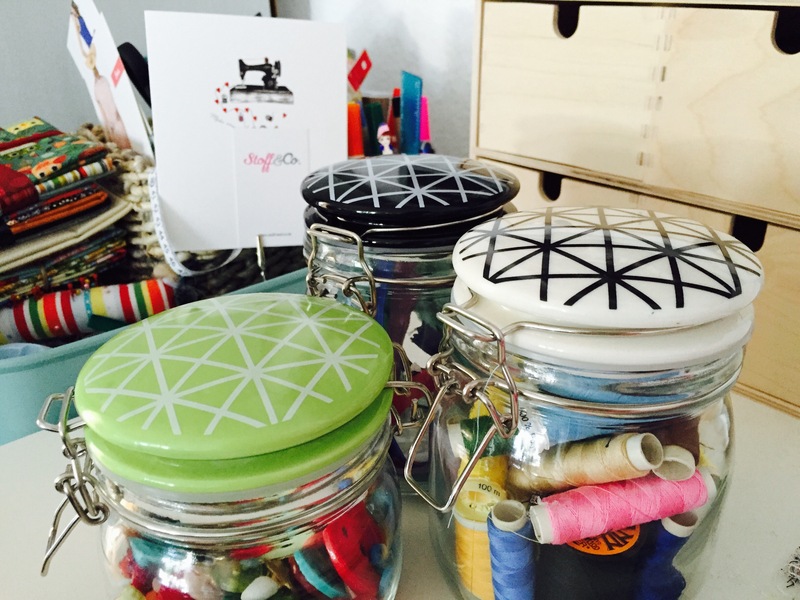 How do you organise your sewing space? Do you have any inspiration for me for when I move to my new home? This is actually a great idea! I’m such a chaotic person, I usually have bits and pieces in various boxes all around the place, as a result I never find anything. My mom is planning a sewing room in the basement of my parents’ house once renovations are done, so I’m definitely looking forward to that.